August is coming to a close. We continued to work on the “bigger-ticket” assignments this month and school had also begun. I guess I have to re-program my schedule to include night classes and school readings in my almost heavy daily grind. No rants about that, though. There’s something fun with juggling both work and academics, and a few extracurricular activities every now and then. This month had been filled with hectic days both on work and school, but it had also been one of the more fruitful ones, in terms of accomplishments and more especially, lessons learned. Guard your tongue. I happened to offend a church mate a few Sundays back with my joke. Because the statement has a tinge of truth in it, he felt that there was a double meaning behind the teasing that happened that day. Of course, it was a plain joke for me but well, it went a bit overboard for him, hence a text message later on telling me he was hurt and that he won’t be proposing activities he won’t be able to fulfil. I felt guilty so I told my mother about it. Naturally, she reprimanded me. I apologised over text message that very day. Last Sunday, I apologised personally. It released the burden of guilt inside me and I thanked God He helped me become mature enough to own up to my actions. Aside from this lesson on maturity, I guess the more important nugget of wisdom is on guarding my speech. King Solomon was right when he said that "out of the fullness of the heart, the mouth speaks.” I may or may not have meant what I said but considering the varying sensitivities of those around me, it will always be good to think twice, three times, before I utter the words with my mouth. Always be a cheerful giver. Aside from the Haggardo Versoza schedule we had this month, it was also in the middle of a “financial drought.” The expenses I made in the previous months had all piled up for payment this August so my savings were sacrificed. It was partly because of the lack of foresight on my part and partly because I was less aggressive on saving up. And then, our salary for the whole month was compromised. Gaaaah. Despite such circumstances, challenges to give generously were ever present. I could have closed my hands and told myself not to give this month, but the natural feeling of guilt slowly ate me up inside. So, I resorted back to giving. It should have been crippling but it ended up liberating. Challenges were turned into golden opportunities to prove God’s provision and generosity on every little thing. It was a small but wonderful testimony I will happily share. Teamwork is key. I loved how our team work plans in the office helped us accomplish the seemingly “herculean” tasks assigned to us. This also made work fun. Also, this strengthened the bond I have with my team mates. So kebs sa haters. They’re always gonna hate and potate. Tsarr. Finally, wake up early. This month, a lot of commuters fell victim to at least three horrendous traffic problems; myself included. The first one’s that massive build up in C5 Road caused by vehicle collisions. The accident happened at four in the morning, when a sand and gravel truck slide down the elevated u-turn slot near BGC. The sliding truck collided with seven more vehicles at that same hour. It affected at least three lanes and the heavy traffic snaked its way to P. Tuazon in Cubao. This became more problematic when heavy rains started to pour. Another colleague, hoping to find a better route to the office in Cubao, was frustrated. We even paid a hundred bucks each for the cab to take us to Eastwood but it took us an hour before we even reached Camp Crame from Ali Mall. We ended up working at Cubao. The same thing happened the other day when another vehicular accident in Bagong Ilog and torrential rains paralysed major roads in Metro Manila. Quite a combo. A few weeks back, an MRT train overshot its track which left at least 36 people injured. I later on learned from a friend that one of the injured passengers eventually died. This is just so disappointing. And then of course we learn that the taxes we worked hard for are pocketed by these greedy and shameful public officials. The public are left with no recourse but to brave the floods or walk more than three kilometres just to get to work. Very undignified. Finally, if these problems are not yet addressed effectively, we can always either be too early or too late for our appointments. Let’s go for the first option, hence the lesson to always wake up early. You know you've mined one of your treasured friends when you can talk just about anything under that big scorching sun. Or even when the rains begin to pour endlessly on you. Everything starts with capping the events of the day, or updates on just about everything you feel important to talk about. Until you reach either the more profound recesses of your conversation or the seemingly mundane stuff you'd laugh hard to. Puns. Inside jokes. New names. New code names. Trivias. Whatever. There's always something new to learn or something funny to remember or even something annoying you'd later joke around. By the time you run out of anything to say or talk about, you'd realize that time went by. You spent one, two or more hours chatting and laughing but it all felt less; you want more. Extend the hours, find more interesting stories to exchange. You'd always choose to part ways. Because you know that the next time you see each other, nothing will change. You'd remain fascinated with each others’ stories and happy that you found another soul on earth you’d gladly spend your day with. I've already said this before but I'm quoting it again: the best cameras are those that you have right now. Or something close to that. Anyway, because my camera's a bit bulky and my routes are not the usual ones recently (i.e. meetings held some place happen often), I'm utilising my less-techy camera phone and the handy Instagram filters that come with it to take photos of my daily commutes. I was interested at observing people especially when they're trying to ride that closing LRT or running after the "scarce" jeepneys plying the Cubao-Rosario route. Hahaha! Of course, I am also a hapless victim of the woes of public commuting, but I end up enjoying the ride after a few internal grumbles. Haha! I decided to take photos of commuting people-- I already began with my fellow LRT passengers. I'm still overcoming my fear of snatchers before I begin shooting during jeepney rides. Hahaha! Raindrops. Taken a few weeks ago. Lean on me. Taken last 07.23.14. Book covers of Rowell's YA novels. Identical twins, Cath and Wren, are Simon Snow fans. When they entered the university in spring, Wren is eager to experience the freedom her college life is offering— endless frat parties, drinking feast, and new friends. Cath, on the other hand, would not leave her room and her fascination for fan fiction. A slew of other characters that will turn Cath’s world anew enter the story: Reagan is her semi-annoying room mate, Nick is her writing partner, and Levi is the ever-smiling friend that visits her and Reagan’s room. While I understand that the story’s title connotes that Cath will be the main protagonist, I felt that there was not enough room to explore a bit of Wren’s story arc. The relationships between the characters particularly the twins and their parents would have been fleshed further if Wren was given at least a chapter or two. Finally, I felt there's just too much Cath and Levi flirting and Cath-whining. Meh. Eleanor is new in class. She wears dresses with patches and her bus mates thinks she’s weird. Park is Korean-American and is addicted to punk rock and comics. He thinks Eleanor is weird but he let her sit by his side, anyway. The rest of the ride develops into an endearing love story. The story was written similar to how movie scenes unfold— whenever there are transitions, one can imagine either an abrupt change of stories or more usually a fade-to-black. The language, similar to how usual YA novels are written, allows the readers to get to know the characters more. 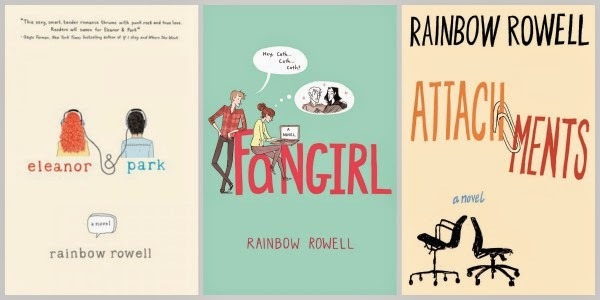 Each chapter was narrated by either Eleanor or Park, and Rowell succeeded in giving each character their own voice and perspective. I really like Eleanor’s lines and how each of these lines relished the feelings of first love. Park was equally loveable, especially his song choices. Hehe. More work, though, on developing the other supporting characters. Park’s mom is already a good one. The novel was said to be turned into movie either late this year or in 2015. I hope it would not disappoint. Anyway, I like this one better than Fangirl.